Fueled by pain and rage over a shattering betrayal, the warrior Rio has pledged his life to the war against the Rogues. He will let nothing stand in his way–least of all a mortal woman with the power to expose the entire vampire race. But now an ancient evil has been awakened, and a stunning darkness is on the rise. For journalist Dylan Alexander, it began with the discovery of a hidden tomb. Suddenly she is at the center of a gathering storm of violence and secrets. But nothing is as dangerous as the scarred, lethally seductive man who rises from the shadows to plunge her into his world of dark desire and endless night. Here she is powerless to resist Rio's touch, even as she uncovers a shocking link to her own past. Now Dylan must choose: Leave Rio's midnight realm, or risk it all for the man who has shown her true passion and the infinite pleasures of the heart . . . .
* New York Times bestseller * USA Today bestseller * Publishers Weekly bestseller * Borders bestseller * Der Spiegel bestseller (Germany) * Nominee – 2008 Romantic Times Award "Best Vampire Romance" * Nominee – 2008 P.E.A.R.L. Award "Best Vampire Romance"
"I am having a hard time trying to explain how fabulous I found this book without sounding like a gushing Lara Adrian fan-girl! MIDNIGHT RISING is absolutely superb . . . as soon as one 'mystery' would get explained, Ms. Adrian would add more teasers to entice . . . This is a spellbinding series!" "Packed with danger and action, [MIDNIGHT RISING] also explores the tumultuous emotions of guilt, anger, betrayal and forgiveness. Adrian has hit upon an unbeatable story mix!" 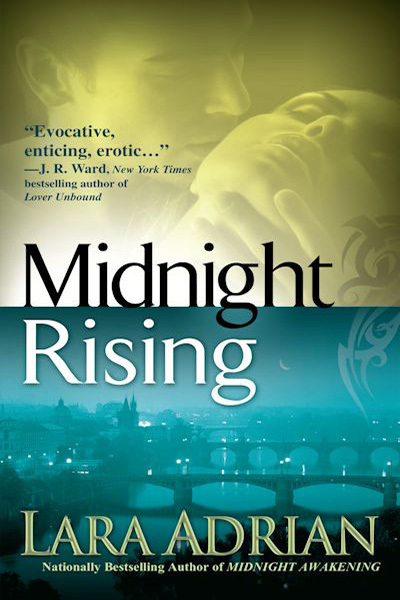 "MIDNIGHT RISING is yet another solid and engrossing vampire romance. . . . [Dylan and Rio] are a superb pairing and a testament to the healing power of love." "Another thrill ride from talented Lara Adrian! A 'not to be missed' and definite keeper for any paranormal lover."